The total solar eclipse is seen in Madras, Oregon. Unless you’ve been living in a fallout bunker (and who would blame you), everyone should know Monday is the day people around the U.S. have been excited about for the past few months. 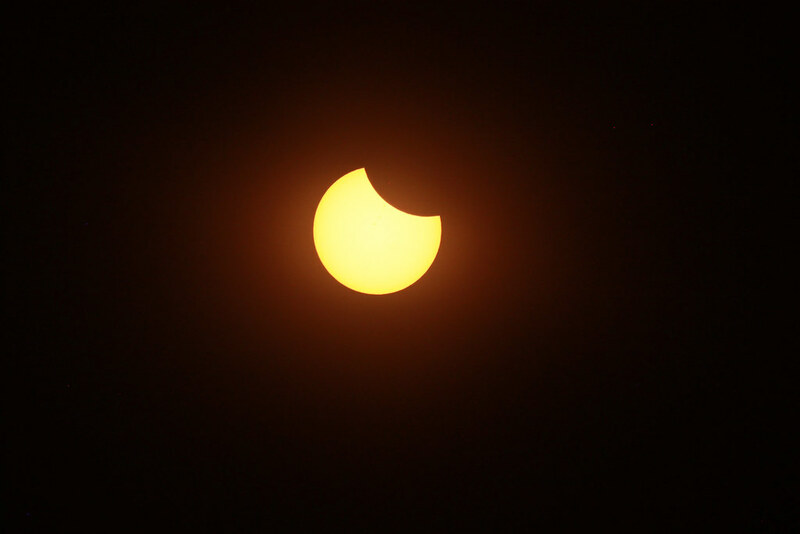 Yes, the total solar eclipse has finally arrived. Photographers across the country captured the phenomenon in various stages with cameras fitted with special filters, along with images of crowds taking in the spectacle. Check out the best photos so far of this rare coast-to-coast event below, and we’ll keep updating throughout the day. A cheerleader uses solar viewing glasses before welcoming guests to the football stadium to watch the total solar eclipse at Southern Illinois University in Carbondale, Illinois. A news photographer adjusts his telephoto lens equipped with a filter in front of the U.S. Capitol on Monday, Aug. 21, 2017, in preparation for today's solar eclipse. A composite image, made from seven frames, shows the International Space Station, with a crew of six onboard, as it transits the Sun at roughly five miles per second during the solar eclipse. A man looks through his solar viewing glasses in New York City. Ross Lake, North Cascades National Park, Washington. People watch the Solar Eclipse in Depoe Bay, Oregon. The 'diamond ring effect' is seen during a total solar is seen from the Lowell Observatory Solar Eclipse Experience in Madras, Oregon. A total solar eclipse is seen from the Lowell Observatory Solar Eclipse Experience in Madras, Oregon. Totality in Depoe Bay, Oregon. A Mexican boy looks through a telescope at the beginning of the solar eclipse, at the esplanade of the Museum of Natural History in Mexico City. The "Bailey's Beads" effect is seen as the moon makes its final move over the sun over Madras, Oregon. Members of the media watch the solar eclipse at the White House. Attorney General Jeff Sessions, left, and Commerce Secretary Wilbur Ross watch from the White House. President Donald Trump watches from the Truman Balcony. The sun is is in full eclipse over Grand Teton National Park outside Jackson, Wyoming. A man takes a look at the solar eclipse at Liberty State Island in New York. Enthusiasts Tanner Person and Josh Blink, both from Vacaville, California, atop Carroll Rim Trail at Painted Hills, a unit of the John Day Fossil Beds National Monument, near Mitchell, Oregon.